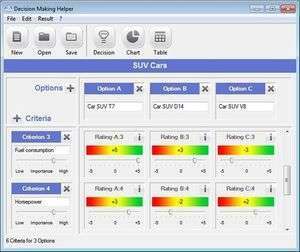 The innovative software tool Decision Making Helper provides support in the decision making process by enabling to take confident and structured decisions. To find the right decision will become a child's play without losing sight of the seriousness of the decision-making process. The decisions once taken will be reasonable and understandable which then can be presented convincingly towards third parties. For security reasons, you should also check out the Decision Making Helper download at LO4D.com which includes virus and malware tests. Additional screenshots of this application download may be available, too.